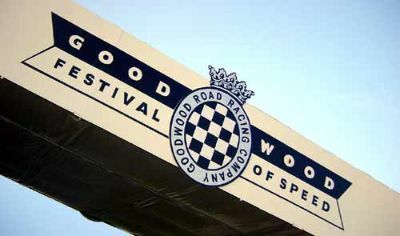 Goodwood Festival of Speed is in my opinion one of the best motorsport events in the world. If you have a ml of petrol in your veins, you must attend this event, usually held in July. I must confess that a major attraction to Goodwood for Tessa and I is the chance to see and hear current F1 cars close up. More and more teams are attending, and the F1 boys are usually out to entertain. the cars are not timed up the hill (officially anyway!) Jenson Button started the trend for stopping along the course and demonstrating tire smoking, full bore starts and skids. Not quick in a race situation, but entertaining on a small English country driveway. In the 2001 Jaguar, Johnny Herbert took it a stage further and performed perfect, very smokey donuts up the hill. Ok - its not what these cars are for, but as a demonstration of the noise and power, its pretty affective in such a confined space. The noise is fantastic, and sends shivers up my spine. Unlike most modern F1 race tracks, here you are with in a few metres of the cars. 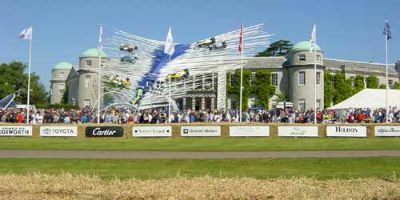 Held at Goodwood House near Chichester, in 2002 Renault were the guest manufacturer. It has become tradition to have a huge display in front of the house. The main event is a Hill Climb up the driveway. Some runs are timed, some are demonstration. Other support events include displays, tank rides and of course the Red Arrows! In 2002 the current Scuderia Ferrari F1 team attended - the only event they visited away from the F1 calendar. 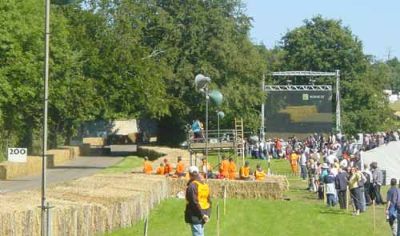 The display, which concentrated on Renaults F1 involvement, towered in front of the house. The F1 cars are fully supported by the team! Here a Renault truck sneaks onto the track for a quick run! 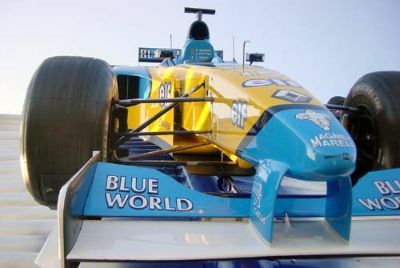 Other F1 teams that attended in 2002 were BAR, Jordan, Jaguar, Williams, Ferrari and McLaren. Access to the paddock area is un-surpassed. A great chance to see a modern F1 car up close and in pieces. The detail on these cars is stunning. 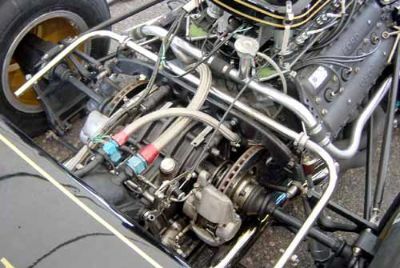 Whilst the current F1 cars are a favorite, the event has also given me a new founded interest and respect for cars from an older generation. The noises are just as superb, the cars just as quick, and the detail just as fascinating. 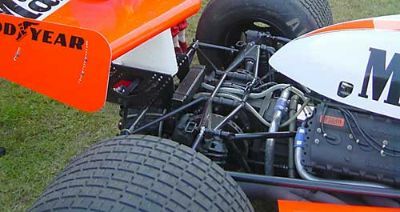 Older F1 cars are even more accessable. This is what Goodwood is all about - priceless cars standing on the grass, with no ropes or barriers. 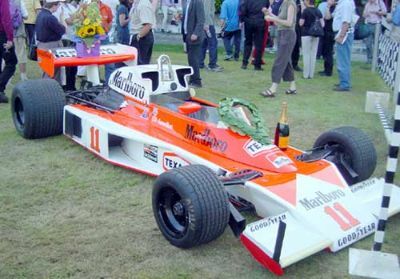 This ex-Hunt McLaren has won its class - hence the Champagne! A great chance to explore every detail of these preserved cars - however the great thing is that most are driven up the hill - often by their original drivers. 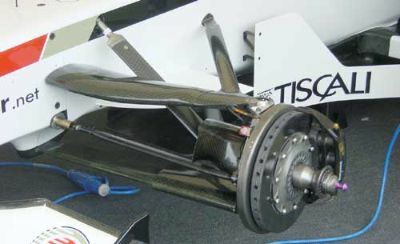 Detail showing the in-board disc brakes on a JPS Lotus F1 car. I think it is from '72. Emmerson Fittipaldi drove it up the hill - the last time he had driventhe car was the last race of the '72 season. Prizes are given for the fastest time up the hill in a given class, beauty, rarity or just for diplaying spirit! 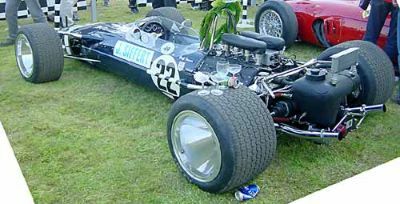 Note the glasses and cans on this winning Lotus - no respect!! I am sure I recognize that steering wheel! Note the tiny gear lever. 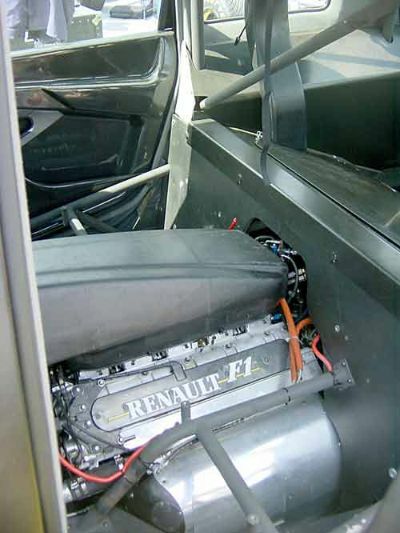 Youwould never get this close to such cars in any museum, yet here you can stick your head in the pedal box! 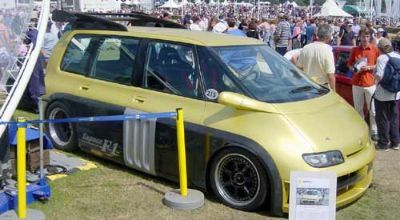 As well as bringing many race cars, Renault also brought this amazing Espace. 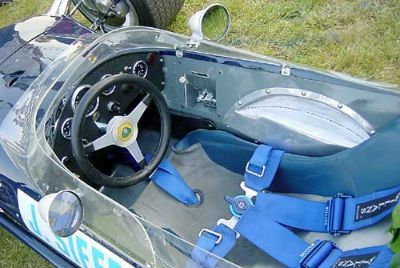 It was built by Williams for publicity and giving potential sponsors demonstration rides. 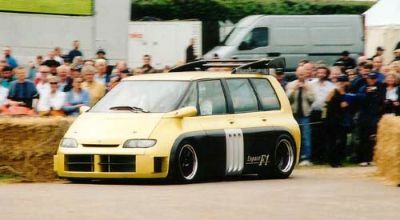 The slightly unusual think about this Espace is that under the familiar, if slightly pumped up, body is a Williams F1 car, as driven by Alain Prost in the mid 90's. The concept enables a passenger to be given a ride of their lives in a 700bhp car. Top speed was in the region of 180mph, and acceleration equally stunning. And of course the great thing about Goodwood is that we got to see it running up the hill. Its very surreal to see an Espace drive past so quickly with an F1 engine note! BMW have a Le Mans powered X5! 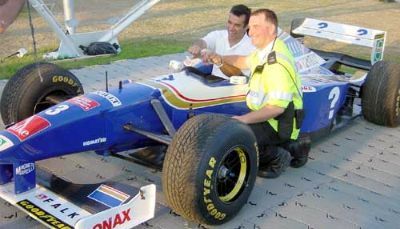 Ex-Damon Hill championship winning Williams Renault, along with one of Her Majesty's finest in jovial mood!